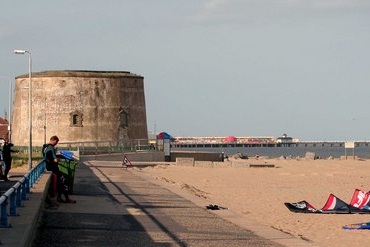 Overlooking the vast expanse of Blue Flag winning Martello Beach in Clacton-on-Sea sits the Napoleonic War-era defence building that allowed its name to the surroundings. From the distance, the tower has the appearance of a benign robots head, sticking up out of the grassland, making it a great place for families. Inside, the concaved walls offer space for local artists to show their work. The yearly Coastal Open Show starts in September, but before then you can attend to a War-themed exhibition. There is a great fight on the sand (May 14 and 15) based on the idea, what would have been the outcome if Napoleon had invaded the UK via Essex? For a more calm look at history and culture, but also on a Blue Flag award-winning beach, take a trip to Walton-on-the-Naze. The old, 86ft Naze Tower is home to an art gallery, tea room and museum. At the top of the 112-step spiral staircase is a viewing platform, affording spectacular panoramic views of up to 31 miles, on a clear day. To the north, that’s as far as Orford Ness lighthouse in Suffolk and the Kent coast to the south.